I think most of us have limited ideas about what we are capable of. If you are a dancer, you know you’ve had those moments where your body goes somewhere or does something that blows your mind, and you can only “sit back and watch.” Well, I think that’s a pretty good way to work! I think when you have those mind blowing experiences while moving, your kinesthetic sense is on, it’s alive. In our mind-dance that uses this sense, we are going to add in two more spots to track: one on each leg. Specifically, a spot exactly in the middle of the top your tibia (the larger of the two lower leg bones in the image above). 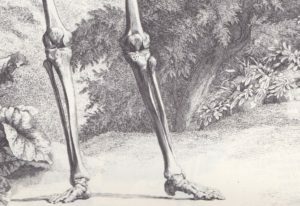 Notice that the fibula, the smaller bone, does not go up as high as the tibia. The tibia is what supports your femur; the fibula is off to the side. At first, you can just play with being still, and knowing where these 4 spots are in relationship to one another, and observe how/if they move in relationship to each other as you breath and relax. This is the first step to saving your knees – just knowing where they are. Your lower leg is a really powerful lever and is very important in supporting and generating movement. Next post, we’ll look at ways to experiment with these 4 points in movement.